NAB 2019 officially kicks-off tomorrow, and despite having already announced a bunch of new stuff, Canon have a couple of new 4K portable broadcast zoom lenses designed for 2/3-inch camcorders that they’d like the broadcast world to know about. As a reminder, for those of you just tuning in, in the run-up to NAB 2019, Canon have already announced a few new compact 4K camcorders (Canon XA40/50/45/55) and a new set of PL-mount Sumire cine primes. Canon have been making serious broadcast lenses for decades, and despite the fact they may not be as flashy as cine lenses in terms of getting the spotlight at big trade shows, the broadcast lenses segment is a huge part of Canon’s business. For NAB 2019, Canon launch two new additions to its UHDgc series of portable-zoom 4K UHD broadcast lenses: the CJ18ex28B IASE S and CJ15ex8.5B. 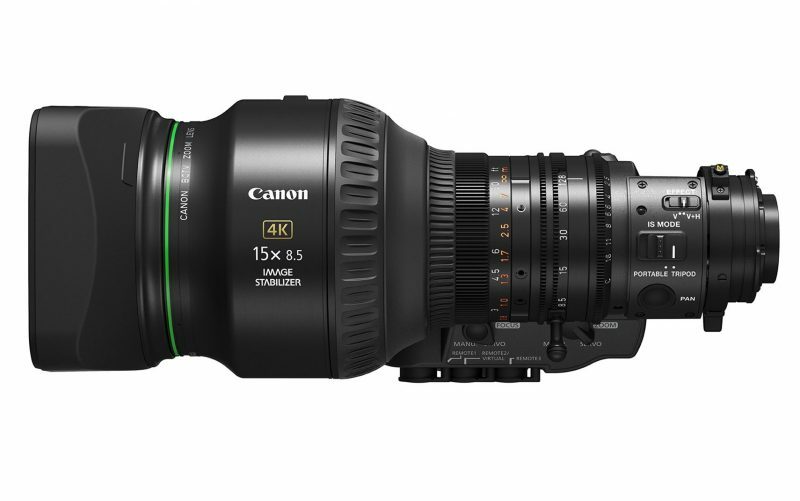 These new lenses are compatible with 4K UHD broadcast cameras that have 2/3-inch sensors. 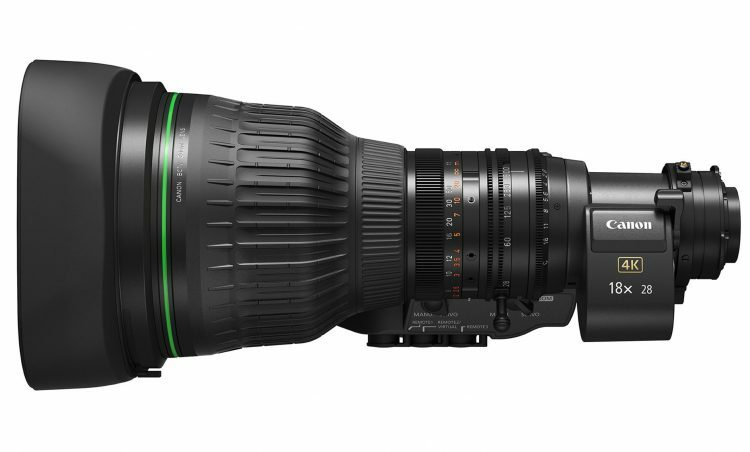 The new Canon UHD lenses provide impressive UHD optical performance, while maintaining a compact and lightweight design to meet versatile and ever-changing needs of a broad range of video productions including documentaries, sports, events and news coverage. 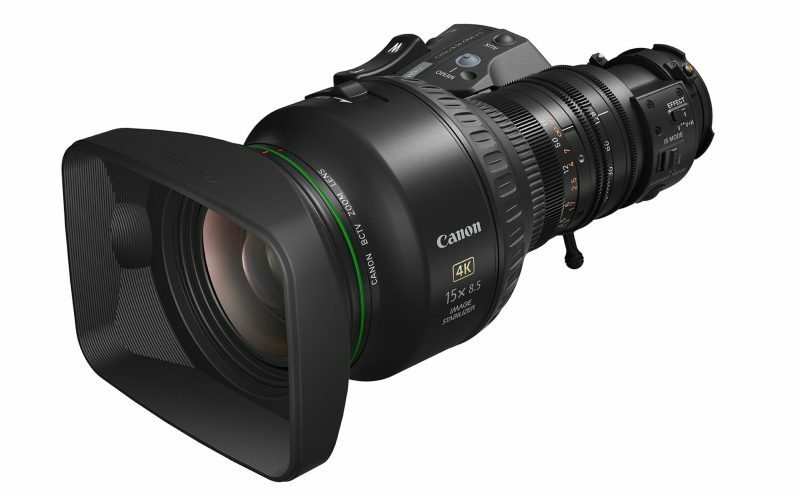 Both the Canon CJ18ex28B and CJ15ex8.5B utilize Canon’s proprietary optical design technology featuring materials such as fluorite and Ultra-Low Dispersion (UD) glass to achieve high 4K UHD performance across the entire zoom range. In addition, these lenses support the wide colour gamut approved by the ITU-R BT.2020 UHD broadcasting standard. The ergonomics and digital servo operational controls of the lenses are similar to Canon’s current lineup of portable zoom lenses, providing users with maximum mobility in a variety of shooting situations. The CJ18ex28B lens features a zoom range of 28-500mm (56-1000mm with built-in 2x extender), making it ideal for capturing crisp shots at long distances, while remaining compact enough to be operated in a shoulder-mounted configuration. The CJ15ex8.5B features Canon’s exclusive Vari-Angle Prism (VAP) Image Stabilization technology to help minimize vibrations on both the horizontal and vertical axes during mobile shooting, such as during sporting events. Both of these lenses fill a unique need for specialized shooting environments in the broadcast market. The Canon CJ18ex28B and CJ15ex8.5B 4K portable broadcast zoom lenses will debut at the NAB 2019 in Las Vegas next week and you can check them out at the Canon booth (C4425). The new lenses are expected to start shipping early Summer 2019. For more info head over to usa.canon.com/broadcast.